Manufacturing of Cu-MgO composites critically requires that the raw materials have a very high level of purity (99.5-99.9%) to achieve the desired manufacturing results. A composite material is made by combining two or more materials – often ones that have very different properties. The two materials work together to give the composite unique properties. Metal matrix composites, reinforced with ceramic particles are potential candidate materials for a variety application. The importance of these composites could be attributed to their high stiffness, superior room and elevated temperature strengths, improved wear resistance and low coefficient of thermal expansion. Recently, there has been a great demand for high strength, high wear resistance and high conductivity connector materials with rapid advancement in the electronic industries. Copper as matrix material is attractive for its excellent combination of thermal and electrical conductivities, plasticity, softness and formability. These characteristics make copper matrix composites popular for a wide range of applications in electronic packaging or manufacturing of electrodes and contact terminals. However, excessively high softness besides low hardness and wear resistance of pure copper limit its structural applications. 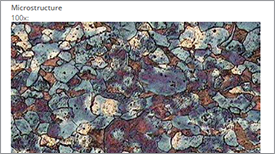 Oxides, carbides, and borides are widely incorporated in the soft and ductile copper. Adding hard particles into copper matrix enhances the mechanical performance and wear resistance of copper. Several processing techniques could be used for the production of metal matrix composites, which could be grouped into two main routes depending on the state of matrix during the fabrication process, either liquid or solid routes. Powder metallurgy process (PM) lends itself well for economical mass production components. Due to low density, high thermal conductivity and a small difference in coefficients of thermal expansion, as well as the super thermodynamic stability, MgO is a desired reinforced phase for copper matrix composite. In order to manufacture Cu-MgO composites copper powder with 99.9% purity and 40 μm particle size and MgO powder with 99.5% purity and 0.1μm particle size was used as starting materials in the study of G.F.Ç. Efe, M.İpek, S. Zeytin, and C. Bindal. The powders including 0.5, 1, 2 and 3 wt.% MgO reinforcement were mixed mechanically and were pressed in a steel mold of 15 mm in diameter with an axial pressure of 220 MPa and sintered at 700°C in an open atmospheric furnace for 2 h embedded in graphite powder in order to prevent oxidation. 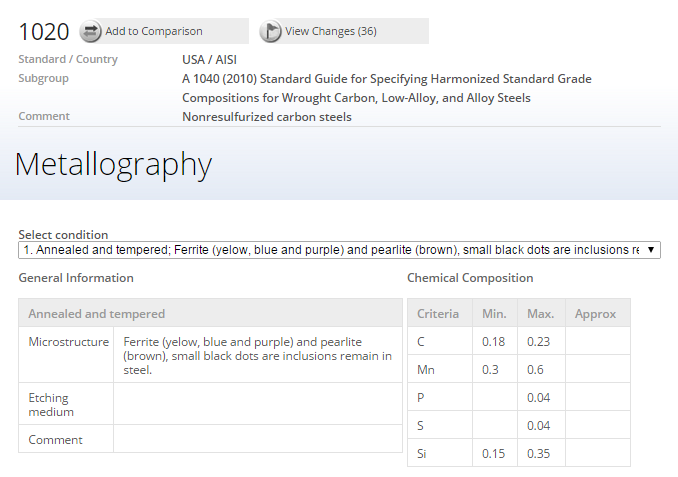 Following sintering, sintered compacts were immediately get out of the furnace and pressed with a load of 590 MPa, while sintered compacts were still hot, to have higher relative density and electrical conductivity. 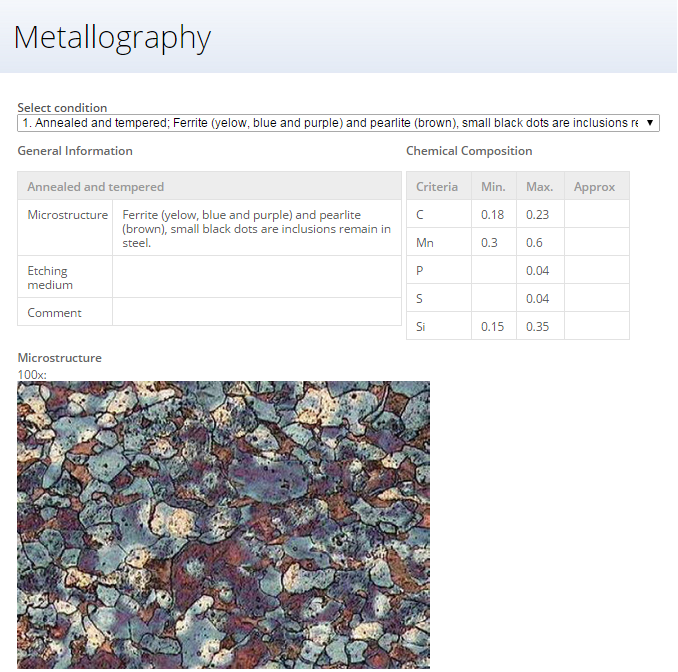 The microstructures of specimens were examined by scanning electron microscopy (SEM). In order to detect the Cu, MgO and any oxide X-ray diffraction (XRD) and energy dispersive spectroscopy (EDS) analyses were performed. Relative densities of copper and Cu-MgO composites were determined according to Archimedes’ method. Micro hardness of both pure copper and composites were determined using a Leica WMHT-Mod model Vickers hardness instrument under an applied load of 50 g. The measurements of electrical conductivity of sintered specimens were performed on a GE model electric resistivity measurement instrument in terms of S/m. At least mean of five measurements were transformed to %IACS by multiplying with 1.7241. 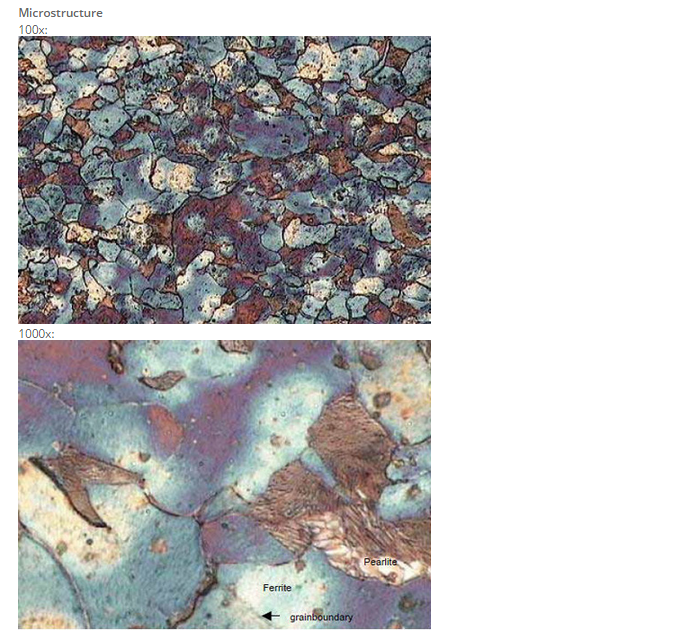 SEM micrographs of starting powders, Cu and reinforcement agent MgO, used in experimental studies were given in Figure 1 and Figure 2 respectively. Copper powder is flat and irregular shape with particle size of 40 μm (Figure 1). MgO particles are in spherical shape and 0.1 μm particle size but significant powder agglomeration was observed (Figure 2). 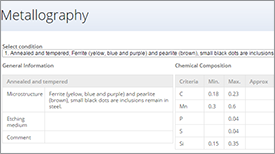 As it can be seen in Figure 2a there are agglomeration and agglomerated MgO particles are about 10 μm size. At higher magnification it is obvious in Figure 2b that the real size of MgO particles are submicron. 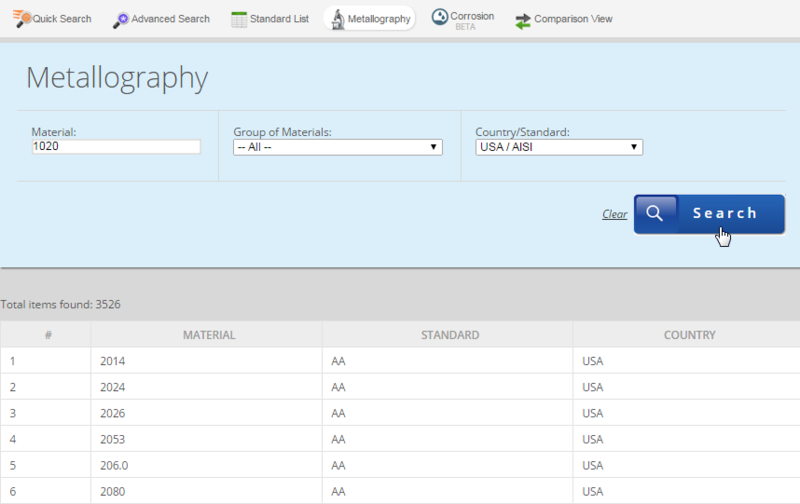 Relative densities of sintered pure Cu and Cu-MgO composites calculated using Archimedes’ principle were given in Table 1. It was found that relative densities of composites decreased with increasing MgO content. Duo at al. claimed in their studies that there is a poor bonding between copper matrix and ceramic reinforcement. Higher MgO particles preclude copper atom diffusion. Also adding of MgO particles having lower density than copper into the Cu matrix leads to decrease of composite density. Low MgO addition to Cu matrix means less Cu-MgO interface and less copper atom diffusion barrier thus copper atoms can diffuse easily and fill the interstices between the MgO particles. Higher MgO addition prevents diffusion of Cu atoms and increases the porosity content of composites resulting in decrease relative density. The electrical conductivity of annealed pure copper is described as 100% IACS (International Annealed Copper Standard) . The electrical conductivity values of composites determined by taking inverse of resistivity were given in Table 1. Electrical conductivity values of Cu-MgO composites decreased with addition of MgO particles as well as relative density results. The addition of ceramic MgO particles being nonconductive into the Cu matrix by decreasing relative density prevents the mobility of electrons, distorse the structure and increases the electrical resistivity so result in decrease in electrical conductivity of composites. 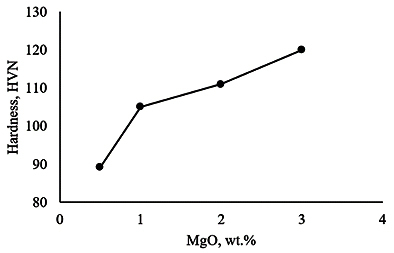 Hardness of composites increased with increasing weight percentage of MgO particles (Figure 3). 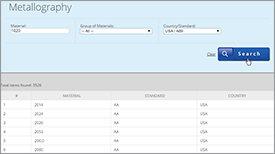 Each value shown in Table 1 and Figure 3 is the average value of five measurements. Hardness measurements were performed taking care of the indenter in containing both Cu and MgO areas. 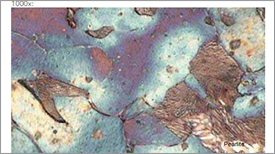 As it is well known that, the hardness of ductile copper can be improved by dispersion of second hard phase. It is thought that higher amount of ceramic particles in the matrix result in more dislocations that increases the hardness of the composite. MgO particles reduce grain boundary energy and its mobility, hinder the motion of dislocations, stabilize the size of Cu grains by preventing the grain growth at elevated temperatures, remain stable in Cu matrix and thereby improve the strength of the composites. In the present, study hardness of copper increased considerably with the additions of MgO particles that can be attributed to higher hardness and dispersion hardening of MgO. This result was consistent with another research. 3. GFÇ Efe, M.İpek, S. Zeytin, C. Bindal. : Some properties of Cu-MgO composites produced by powder metallurgy. Res. Eng. Struct. Mat., 2016; 2(2), p.67-74.